Status: Rare casual spring and summer visitor statewide. Documentation: Recording: 25 May 1986 Knox Co (Brogie and Brogie 1987, Brogie 1999). Taxonomy: Five subspecies are recognized, three in South America, and two in North America: coterniculus of California and Baja, Mexico, and jamaicensis of the eastern United States and Central America. Nebraska birds are presumed jamaicensis. 25 May 1986 recorded in Knox Co (Brogie and Brogie 1987b; Brogie 1999). Additional undocumented reports are 22 Apr 1980, a single bird flushed and briefly seen near Lincoln, Lancaster Co (Ducey 1980, not accepted by NOURC, Brogie 1999), 10 May 1987 near Holstein (Turner 1987), 11 May 2015 Pioneers Park, Lancaster Co (not accepted by NOURC, Brogie 2016), 13 May 1979 Funk WPA, Phelps Co (Brown 1979), 29 May 1981 Crescent Lake NWR, Garden Co, and 31 May 1995 Crescent Lake NWR (NBR 63:74). There are also two old undated reports from West Point and at the Omaha Market (Bruner et al 1904). Spring arrival may be earlier than the above records suggest; one was at Quivira NWR, Kansas, 16 Mar 2007. Eddleman et al (1994) stated migration is mid-Mar-early May, suggesting that the late May reports above could involve nesting (see Summer). 15 Jun 2016, one recorded calling at Harvard WPA, Clay Co (McGregor et al 2016). The record cited above was obtained during a secretive marsh bird survey conducted statewide; no other Black Rails were detected during the study (Dinan et al 2018). There are 13 additional summer reports, nine of which are from Crescent Lake NWR 1978-1995 between dates 18 May-6 Sep; several of these sightings were in 1995, when birds identified as this species were in short sedges and grass at the outer margins of Goose Lake during a period when the water table was unusually high (Larry Malone, pers. comm., Cortelyou 1981, Silcock 1995). Only one of these reports was submitted to NOURC; insufficient detail did not allow acceptance (Brogie 1997). Searches at Goose Lake in 1997 and 2001 were unsuccessful in locating the species. Additional reports are of one “calling incessantly” 24 Jun 2006 at the west end of Calf Creek Valley in Valentine NWR, Cherry Co, a calling bird in extensive sedge wetland at Facus Springs, Morrill Co 9 Jul 2001 (not accepted by NOURC, Jorgensen 2003), a “small black bird” suspected to be this species flushed by a mower in Dodge Co 30 Jun 2011 (not accepted by NOURC (Brogie 2013), and one flushed at Fontenelle Forest, Sarpy Co 27 Aug 2006 (Silcock 2006). Comments: There are a few reports for Fall, none with tangible documentary evidence: two birds in Richardson Co in 1873 (Bruner et al 1904), 20 Sep 1979 at Cunningham Lake, Douglas Co (Cortelyou 1979), one flushed at Spring Creek Prairie, Lancaster Co 26 Sep 2008 (not accepted by NOURC, Brogie 2009), and “kick-ee-kerr” calls heard 1-8 times on each of 3 days 27 Sep, 3 Oct, and 11 Oct 2015 at Peru Bottoms WMA, Nemaha Co, by multiple observers (not accepted by NOURC, Brogie 2016). According to Eddleman et al (1994), fall migration takes place early Sep to early Nov, with most records mid-Sep to mid-Oct. These dates fit the pattern of observations for Nebraska. Fall departure of interior summering birds is thought to be during October; there are Kansas dates 17 and 29 Oct (Thompson et al 2011), and an Iowa date 8 Oct (Kent and Dinsmore 1996). The status of the Black Rail in Nebraska is enigmatic, primarily because the species is difficult to detect, there are few reports of the species and most lack extant documentation. All of the state’s reports involve either calling birds or brief observations of flushed birds. Prior to the recording obtained in 2016 (cited above), there was only one accepted record for this species, a recording that the observers themselves noted is of poor quality (Brogie and Brogie 1987b). It has been suspected that Black Rails occur more frequently than the few reports indicate; Rapp et al (1958) stated, without citing supporting data, that Black Rail “probably breeds in suitable habitat, as Nebraska is well within its breeding range.” Southeast Nebraska is included in the probable summer range by most authors, even though data supporting this conclusion is minimal. Most intriguing are the several reports at Crescent Lake NWR noted above. Also notable are recent credible reports from Facus Springs, Harvard WPA, and Peru Bottoms WMA. The observer for the latter reports suspected that Black Rails could possibly have been present there during the summer and may have bred. Because Black Rail breeding habitat is ephemeral, and often located where livestock grazing or wetland modification occurs, breeding sites probably change from year to year and are difficult to predict. Most nests are found in Jun in the eastern United States (Eddleman et al 1994). Thus, observers attempting to find this species should be cognizant of habitat conditions at sites where the species could possibly occur. 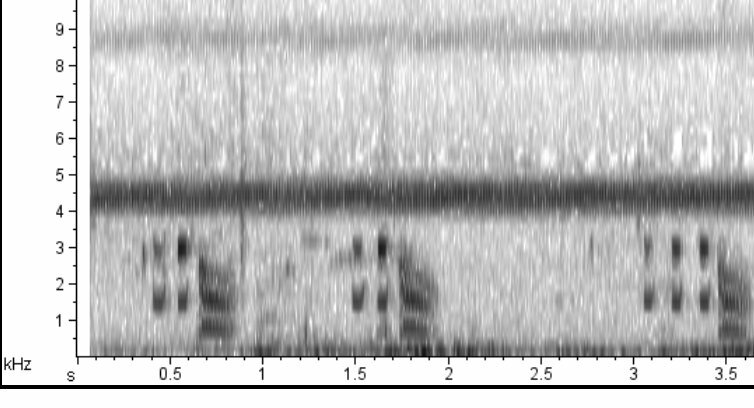 Spectrogram (top) of a Black Rail call at Harvard WPA originally published in McGregor et al. 2016 and used here with permission. Brogie, M.A., and E.M. Brogie. 1987. Black Rail in Knox County, Nebraska. NBR 55: 40-41. Brown, G.W. 1979. Marsh birds. NBR 47: 67. Cortelyou, R.G. 1979. A possible Black Rail. NBR 47: 67. Ducey, J.E. 1980. Black Rail in Lancaster County. NBR 48: 88. McGregor, C., E. Bruster, M.B. Brown, L.R. Dinan, and J.G. Jorgensen. 2016. A documented occurrence of Black Rail (Laterallus jamaicensis) in Nebraska. NBR 84: 132-137. Turner, H. 1987. Minden notes. NBR 55: 43.